Rare Royal School of Needlework silkwork panel. 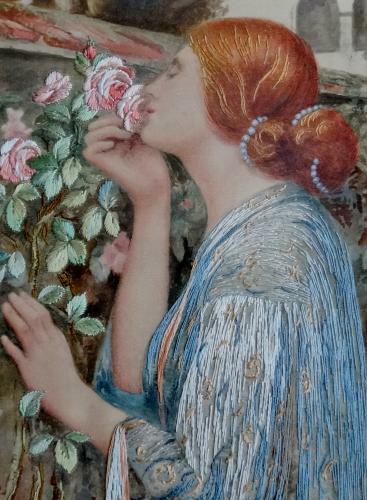 An exquisite and simply captivating, small framed (original frame, possibly rosewood) silk & needlework painted textile panel by the Royal School of Needlework (labeled), depicting the famous painting by John William Waterhouse (1849-1917), “The Soul of the Rose”; c1908. Additional label to back stating Roy Miles Gallery. Roy Miles (1935-2012) was a famous flamboyant Mayfair art dealer, with galleries in Duke St, Berkeley Square and later Bruton St.
By repute, he combined unabashed self-publicity, a flair for throwing a good party with the business of successfully selling fine art! h: 11” w: 8” inc original frame.